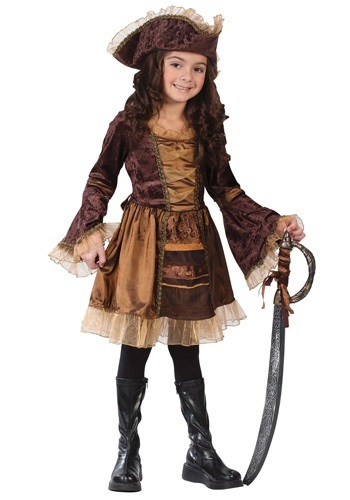 Child Sassy Victorian Pirate Costume By: Fun World for the 2015 Costume season. This little lass isn't afraid to sword fight you for that buried treasure! This Child Sassy Victorian Pirate Costume is a fun pirate costume for little girls because of the fun golden trimmed skirt and the beautiful ruffled trimmed pirate hat. Pick up a pretty matching sword to complete the look and get ready to hassle some pirates for the golden treasure!